The Kingpin's real name is Wilson Fisk and he is the crimelord of crimelords. He is the mastermind and power broker behind much of the crime in New York City. He is often depicted as being physically massive and is able to go toe to toe with superheroes such as Spiderman and Daredevil. 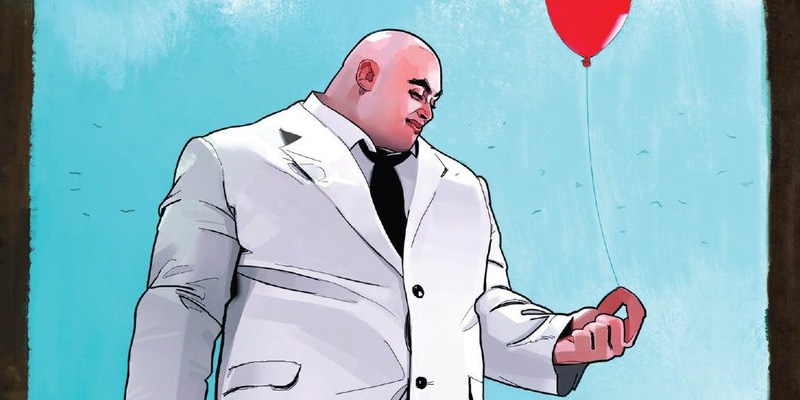 Wilson Fisk is poor,fat, New York kid who is taunted for obesity and incessantly bullied. 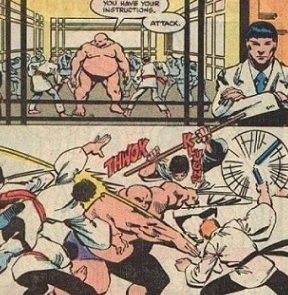 The bullying drives Fisk to train in martial arts particularly in the art of sumo wrestling. Fisk begins to beat up and brutalize the bullies that once preyed on him. He is completely ruthless and megalomaniacal and turns the neighborhood bullies into his own personal soldiers and into a gang. The local Don of crime named Rigoletto notices the skills of the young Wilson Fisk and makes him into his body guard and right hand man. Fisk becomes one of Rigoletto's most feared enforcers. Having gained the respect of of the criminal underworld Fisk kills Rigoletto and takes control of his crime syndicate. Fisk's initial rise may have been a little too fast. The Maggia crime syndicate attacks him and forces him to flee NY. Fisk moves to Japan, opens up a spice business gains wealth and power. While, he appears to have gone legitamate he actually is plotting the overthrow of the Maggia. The Maggia becomes embroiled in a variety of internal and external wars all of which were instigated by Fisk. Fisk then moves and overthrows the Maggia. He consolidates the powers of all the criminal organizations of NY and declares himself the Kingpin of crime. Fisk then becomes a constant villain in the stories of Spiderman, Daredevil, and even the Avengers. 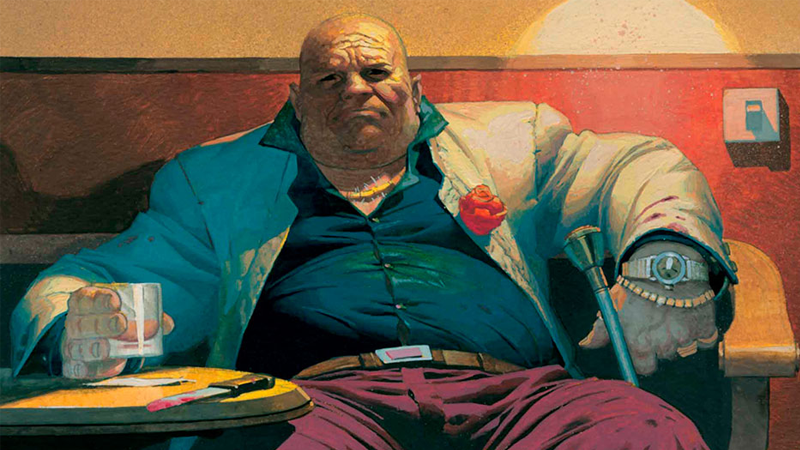 The Kingpin is ranked 10th on IGNs top villains of all time. He began as a Spiderman Villain but evolved into being the arch nemesis of Daredevil. As a Spiderman villain he used a variety of hi tech gadets and gizmos like a cane that fired a laser beam. When he became more of a Daredevil villain he dropped the trinkets and became more a street, hand to hand, style criminal. One of Fisk's weapons his is obese looking appearance that causes others to underestimate his speed and vitality. Most of his girth is actually muscle. Fisk once beat Spiderman in hand to hand combat. Spiderman was saved by the intervention of Fisk's wife. This is partially due to Spiderman's tendency not to go full on against non superpowered foes. When Spiderman was given reason to go full out on Kingpin, he quickly took him down. Do not underestimate the skills or speed of Kingpin. Just because he is big does not mean he is slow. 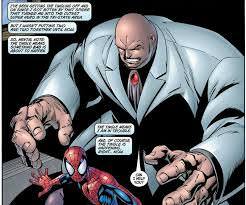 Kingpin has no actual superpowers but he is abnormally large, strong and fast. He is also a very skilled hand to hand fighter and has been shown mowing down a dojo of armed black belt fighters in seconds. He is also a strategic mastermind, and skilled street criminal. The Kingpin was a character in the Daredevil movie and played by Micheal Clark Duncan. In the Marvel Netflix Series Daredevil he will be played by Vincent D'Onofrio. D'Onofrio has now appeared as the Kingpin in Daredevil and Daredevil 2. Do the Seagate Files reveal the secrets of the Kingpin? Welcome to Marvel Villains Week!